Gmail App For iOS Returns to App Store – Download Now! The official native Gmail App has returned to the App Store promising to resolve the issues that had plagued the first version. After appearing in the App Store approximately two weeks ago, and for only moments, the first native Gmail App was pulled due to obvious glitches. For one, the app showed an error message immediately after opening. Although you could override the message, your push notifications did not work, rendering the app useless. Many were surprised that the app passed Apple’s verifications tests, while some conspiracy theorist believed that Apple noticed the errors, but passed it through anyway. The new release has apparently fixed the notification problem. Although the app is limited and will only allow you to link to one account at a time, it may prove useful if you are a frequent user of the labels and search features. As an added bonus, your chats are also viewable through your app, if you choose to save them, anyway. Since I missed the first opening window, I was quick to download the official app the second time around. For some reason I was unable to find it through the App Store from my iPhone. I managed to find it directly from iTunes on my Mac and through the wonderful mechanics of the iCloud, was installed on the rest of my iDevices. Don’t worry, you can’t download the app through the link below! 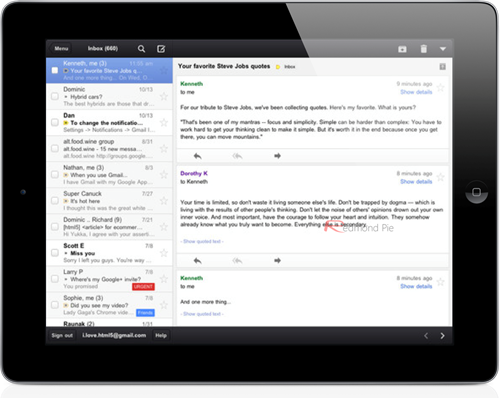 If you read your emails casually once or twice a day, or even less frequently, the app may not be for you. You will receive the notification alert each time a new piece of email comes in. For those that need to know the moment the email comes in, the app will prove essential. Upon testing the app, I noticed new emails would not load on my notification menu. If you hear the generic text message alert and don’t have a text message, it’s probably your Gmail app. It confused me at first so be sure to change your text message alert if you’d like to tell the notifications apart. I don’t believe this is a programming error, but rather a security feature. Be sure to check out the native Gmail app for yourself, and remember to prevent any more glitches with the newer app by removing the old one.